The past two days we have had the temperature reach the 70s here in the city. Summer is coming. I arrived here in NYC last August as the summer of 2012 was nearing its end. But I still got to experience enough NYC heat to know how to prepare myself this year. Oh yes — I had my fair share of sweltering subway rides and fritzy AC units. Before moving here from Florida, a friend who had lived in Manhattan tried to warn me. I remember his words every time I feel this city seep into my flesh. In the winter you get the harsh cold, and in summer you get the damp, dirty heat. Either way, New Yorkers cannot help but wear the city where ever they go. Well, obviously that heat is not upon us yet. But I was driven to this SoHo Starbucks on this soggy Saturday afternoon because I need to armor myself with shorts, tank tops, and flip flops to combat the impending summer temperatures. 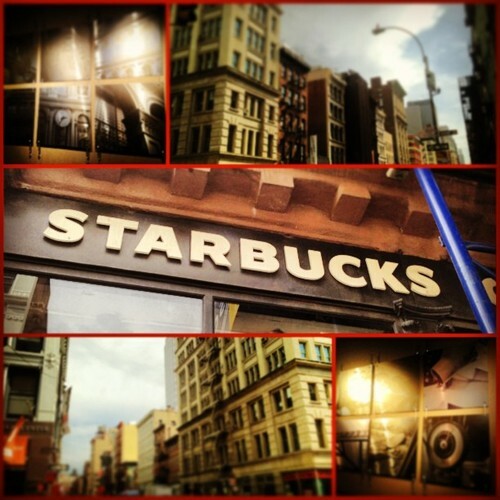 This Starbucks is in a great location on the northwest border of SoHo. It still gets a good crowd, but it’s not overwhelmed like the location on Grand & Broadway. Also it’s directly below Washington Square Park, and the distance between is filled with some pretty decent bars and restaurants that mostly cater to the NYU crowd. It is — of course — Frappuccino Happy Hour, and although this place has a good amount of lines, grabbing a seat wasn’t impossible. With two separate seating areas and even a little bench area in the hall, this location is ready to serve both those grabbing and going and those looking to stay awhile. I’m back in SoHo. I came for a new pair of sunglasses and ended up with a new shirt and an iced coffee. By my count there are at least three Starbucks in this small neighborhood. Which makes sense, since this is a shop-til-you-drop kinda neighborhood and caffeine is essential to bargain shopping. I have a love hate relationship with SoHo. I love the boutiques and the flagship stores, but tend to hate the prices and slow paced tourists that clog the street. In Orlando I used to find myself frustrated by the Sunday drivers. Well, in New York we have Sunday strollers — just as aggravating and sometimes more difficult to get around. 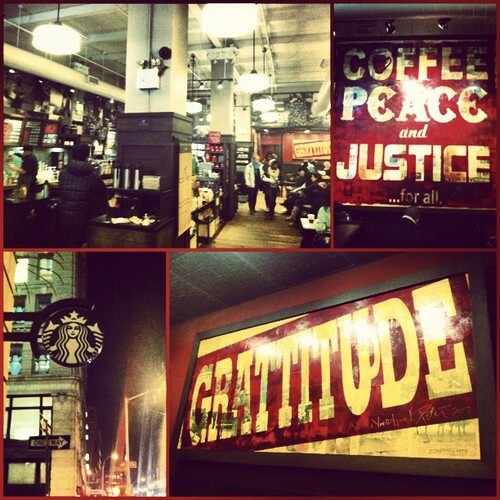 This Starbucks on Grand & Broadway is in the thick of SoHo traffic, and it definitely shows the moment you walk in. Just like you must wait in long lines at the fitting room or the check out counter at the Top Shop across the street, you are forced to do the same here. When I entered both the barista and bathroom line wear 10-15 people deep. Soon after I jumped in line for my iced coffee, the barista bar backed up to the entrance. Luckily, this Starbucks isn’t a total loss. There’s some cute photography and artwork on the walls, as well as a good amount of seating lining the wall opposite the bathroom. Although it was crowded as can be, most people were waiting in one of the two enormous lines so some empty chairs were scattered about the place. As with SoHo itself, I’d only advise coming to this Starbucks on a weekday morning or afternoon. For those less familiar with the neighborhoods of Manhattan, SoHo is the neighborhood of expensive boutiques, expensive lofts, and expensive retailers in general. A good friend once referred to NYC as “a black hole of expenses,” and if that is true, SoHo is the deep-dark center. The name SoHo is actually an acronym, meaning SOuth of HOuston street. And now that you know that, PLEASE do not let any self-respecting Manhattanite hear you pronounce Houston wrong. They’ll either read you to filth, or turn up their nose. It’s Houston like “house-ten”. We’re a long way from Texas, ya’ll. Anyway, onto the Starbucks on the corner of Spring and Crosby. I must admit, that when I selected this to be the 3rd location I would visit, I expected to find a small corner-cafe, a large crowd of constantly shuffling tourists loaded up with shopping bags, and exhausted looking baristas. 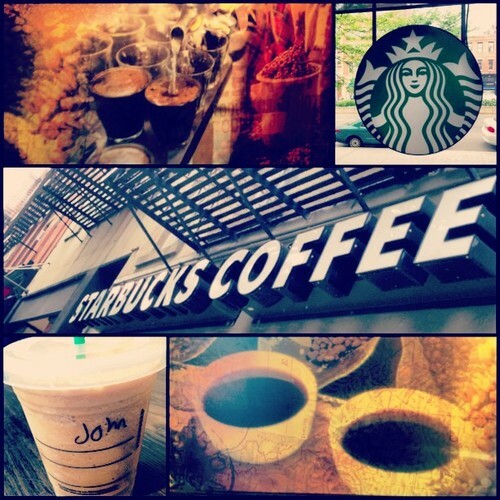 And this Starbucks has totally proved me wrong. Not only is this one of the biggest locations I’ve yet to see in the city, it is also the most inviting. Yes, it gets hit with a hefty crowd of tourists and shoppers alike, but this location brews them up and spits them out, leaving plenty of room for singles or groups to come enjoy a cup of coffee in one of the most picturesque parts of the city. The location itself begs you to look around and gaze. Besides the usual Starbucks advertisements, art hangs on the walls from artist Peter Tunney (captured above), as well as black-and-white images of the coffee-roasting process. Comfy chairs and cushioned benches are everywhere to be seen, and a long-wooden table to seat ~14 stands in the back. And did I mention power outlets are everywhere? Not just on the walls, but on the floor as well. So go on, charge that phone! Bring that laptop! This Starbucks has got a seat for you.